The continuing campaign to keep Moseley Road Baths open has received a cash boost. A grant of $15,000 has been provided by American Express through the World Monuments Fund. The money will be used to promote the baths through various activities leading to a Watch Day. The day will include conducted tours of the building, including areas normally closed to the public. Moseley Road Baths was chosen by The World Monuments Fund as one of fifty sites of international importance which are under threat in its 2016 Watch List. 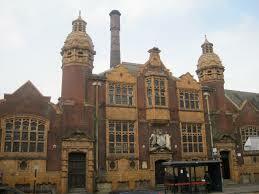 The WMF is providing advice and support to the Friends of Moseley Road Baths in their campaign to keep the Baths open. The grant being announced today will enable the Friends to mount an open day to publicise their work and emphasise the importance of the Baths to the local community. As well as organising a Watch Day, the Friends hope to be able to use some of the cash to improve the appearance of the front of the building and provide a new sign outside so that people realise the Baths are still open. The Baths have been under threat of closure since 2013 but will remain in use until early 2017 when Birmingham City Council intends to close the doors for the last time.